The original version of this report contained errors in Tables 58–61 and Tables 64–67. Some of the data for 2015 in those tables were incorrect. The correct data now appear in this report. About 8.3 million people received federally administered payments in December 2015. The average monthly payment in December 2015 was $541. Total payments for the year were almost $55 billion, including more than $3 billion in federally administered state supplementation. Fifteen percent were under age 18, 59 percent were aged 18 to 64, and 26 percent were aged 65 or older. 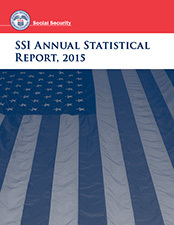 Fifty-eight percent of SSI recipients had no income other than their SSI payment. Despite their disabilities, about 328,000 recipients (4.5 percent) were working in December 2015.